A Florida firefighter has been charged with aggravated manslaughter after his toddler son died after being left inside a hot vehicle for eight hours. Deputies in Pinellas County received a call around 4:30 p.m. Friday informing them a 23-month-old boy was left inside of a truck in the driveway of a home in Palm Harbor. According to the Pinellas County Sheriff, the boy, Lawson Whitaker, had been dead for sometime. 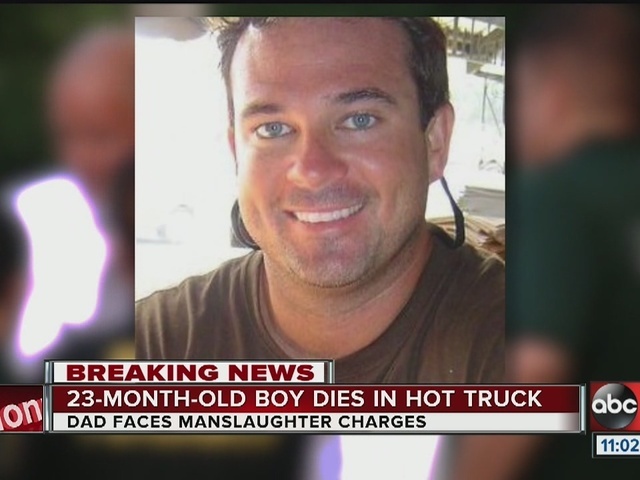 Troy Whitaker, a Hillsborough County firefighter, was taking his daughter to school and his son to daycare Friday morning, according to Sheriff Bob Gualtieri. He dropped his daughter off, but for some unknown reason, didn't drop his son off. He then went home and parked his truck in the driveway. That was around 8:30 a.m.
Later in the afternoon, Whitaker went to the grocery store and drove home. While unloading groceries, he noticed Lawson Whitaker in his car seat. He immediately pulled the boy out, performed CPR and called 911. Unfortunately, his son was already dead. "It's not an intentional act. I'm not saying it is. What I'm saying is, you've got to be responsible for your kids. You can't leave them in their car seat for 8 hours, let their body temperature get to 108 degrees and they die." Sheriff Gualtieri said. Troy Whitaker bonded out of jail after his arrest.